Freeze, thaw, freeze, thaw. This is the weather that a maple syrup maker is waiting for. 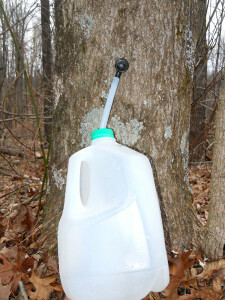 With night time temperatures below freezing and daytime temperatures above 32 degrees, the sap or sugar water in the trees starts to flow. In Indiana, this usually occurs from mid-February to mid-March. A sugar maker then intercepts, collects, and cooks the sap. Boil off enough water, and voilà, you have maple syrup. Sounds simple enough, right? 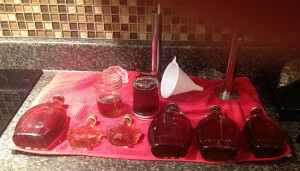 Well, there is a little more to making maple syrup. With a little patience, ingenuity, and a maple tree, you too can be a backyard sugarer. 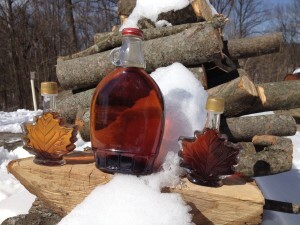 I’ve been making maple syrup in my backyard for nearly 15 years. I learned the trade while I was a naturalist at Southeastway Park in Indianapolis under the tutelage of sugar maker Chris Martini. We tapped 60 trees at Southeastway Park, and I tapped four on my half-acre lot on Indy’s north side. I used milk and juice jugs to collect the sap, cooked over a campfire ring, and used my wife’s cookie rack as my grate to hold the pot of boiling sap. Mr. Martini gave me the nickname Sugarin’ Shane! Soon I was off to Bradford Woods where we established a Maple Syrup Camp for youth that is still taking place some eight years later. When it comes to backyard surgarin’, Rink Mann changed my life. After reading his book “Backyard Surgarin’” I felt like I was a kindred spirit with this old timer who I only knew from his pictures and writing. One of Rink Mann’s mantras is to spend as little money as possible. He shows how cement blocks, old barrels, water tanks, and filing cabinets can be used for making syrup. 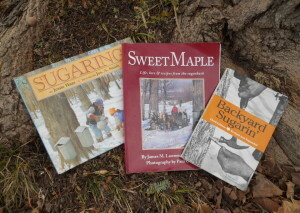 The book “Sweet Maple: Life, lore, & recipes from the sugarbush” is another resource you may find helpful. I will keep it simple and not dive into the mathematics of making maple syrup. 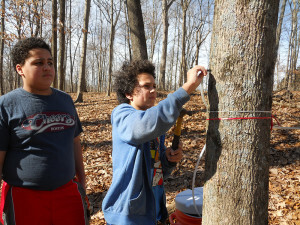 It roughly takes 40 gallons of sap to make 1 gallon of syrup. Sap is usually around 2-3% sugar and syrup is 62% sugar. 1. Gather tools of the trade: spiles (spouts), drill, hammer, plastic tubing, and collection containers. 2. Find a maple tree. Opposite branching is key to identifying maples in winter. Sugar, red, and silver maples are all suitable. 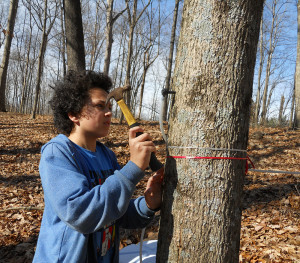 Sap from a sugar maple typically has a higher sugar content, thus reducing your cooking time. I use ribbon to mark maples when the leaves are still on. 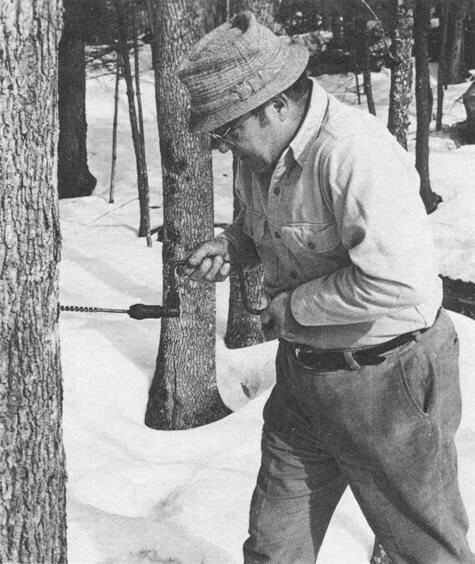 Most say to only tap trees over 10 inches in diameter. 3. Drill a hole. The size of the hole will vary depending on the size of spile you have chosen. Drill approximately 1 ½ to 2 inches deep at a slight angle upward. Like Rink Mann in the picture above. Or like Tanner in the picture below. 4. Insert spile and tap gently with a hammer. 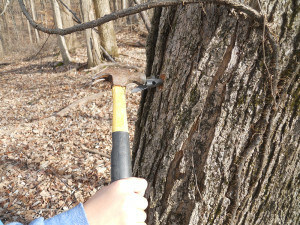 You do not want to hammer too hard as this could split the tree. Give it a “wiggle test” to be sure it is secure. 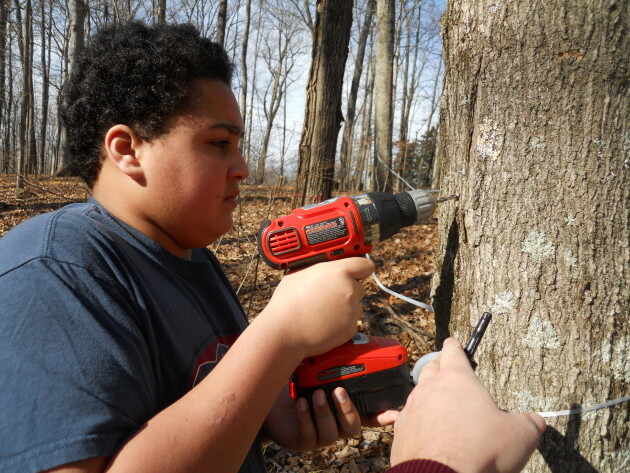 Spiles come in many forms: plastic, aluminum, homemade PVC—or be like the pioneers and hollow out the pith of a sumac branch! Sawyer gently taps in an aluminum spile. Sawyer prepares to tap in a plastic spile attached to a tubing system as Tanner supervises. 5. Taste the sap. This is a must. Our family often drinks the sap and takes a bottle of it in our lunch. 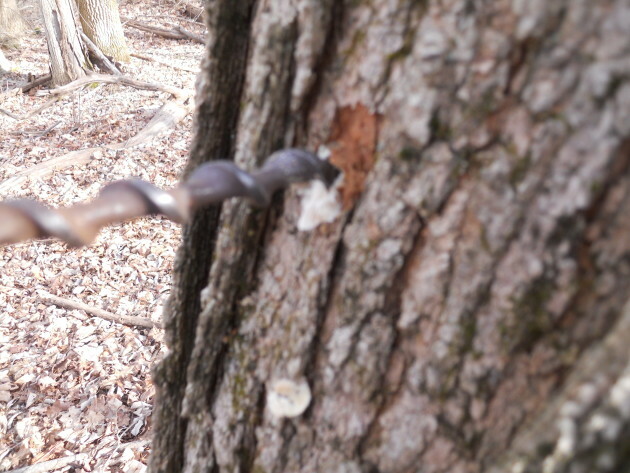 The sap will flow immediately in the right weather conditions. Sometimes you have to wait a bit. Gibson’s cheapest setup: $1.00 plastic spile, tubing, and milk jug. Sawyer hangs an empty pretzel container. Blue sap sacks and sap sack holders. 7. Collect the sap. 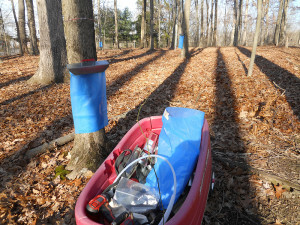 Coolers and a clean garbage-like containers be used to store the sap. 8. Filter the sap. I use an old t-shirt or a mesh insect net works well. This will remove debris prior to cooking. 9. Cook the sap. 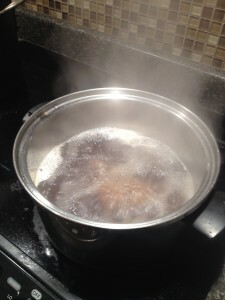 Ideally, keep a rolling boil to reduce the sap as quickly as possible. 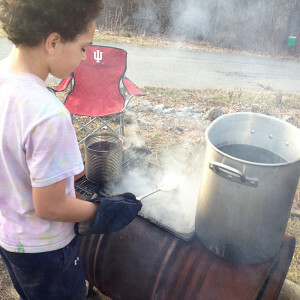 Sawyer scoops out impurities from the cooking sap. Warming pots sit atop the main cooking pan and a coffee can with a nail hole allows warmed sap to enter boiling sap without taking away the boil. 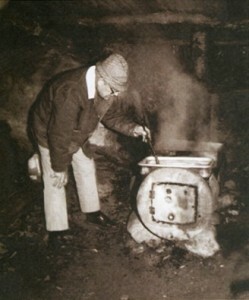 Gibson’s homemade cooker was made with a 55-gallon drum. The barrel became the firebox. We purchased a wood stove kit to add the cast iron door and legs. A restaurant-style chaffing pan rests in a hole in the top of the drum. 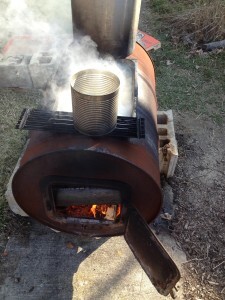 Rink Mann cooks over a 55-gallon drum. 10. Bottle the finished product. Hot bottled syrup is laid on its side to seal and disinfect the lid. The Gibson family and neighboring Tyree family finished about 2 gallons in 2015. In this overview I have left out details are that important to the process, so you’ll want to do a little research. 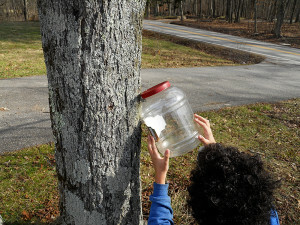 Learn more about filtering your sap and syrup, for instance, as well as techniques to determine when the sap becomes syrup using a candy thermometer, syrup hydrometer, or a spatula. Many resources are available to help you fill in the gaps—including two upcoming Sycamore Land Trust events (details coming soon)! Enjoy the journey toward creating your own golden delicious!